Sports is a unifying entity. We have the ability to put down our differences and enjoy a game or match with anyone. Bitter rivals at work bond over their favorite team, family ties strengthen while reminiscing over all-time greats. And we become more cohesive as a society because of sports. This NFL Anthem Policy is not so cohesive. Except when we disagree, of course. Sports loses that unification ability when they mix with the world of politics and red-tape. Unfortunately, in today’s world, this is inevitable. While it’s true that sports do bring us together, they can also tear us apart. There are a lot of small-minded arguments that make no sense. Enter our latest, once-a-week (hopefully) feature on MING: “Point/Counterpoint”. A chance for these hotly debated topics to be looked at from a different side of things. But only if you’re brave enough to open your mind. First up, the NFL Anthem Policy back and forth. No matter your thoughts going into this, be a man. You don’t like my thoughts, either have a mature conversation with me or move on. Either way, no crying! A couple weeks ago the NFL owners developed a new policy for game days when it came it the national anthem. This was done as an attempt to curtail the numerous players who were kneeling or sitting during the playing of the Star Spangled Banner. It was done as an “informal vote” and added to the game day handbook, which is not subject to approval from the players association nor able to be challenged by the collective bargaining agreement (CBA). 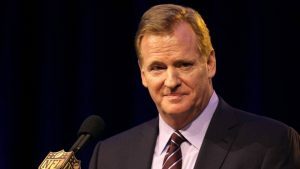 The NFL Anthem Policy has created more issues for the commish than if he had just left it alone. 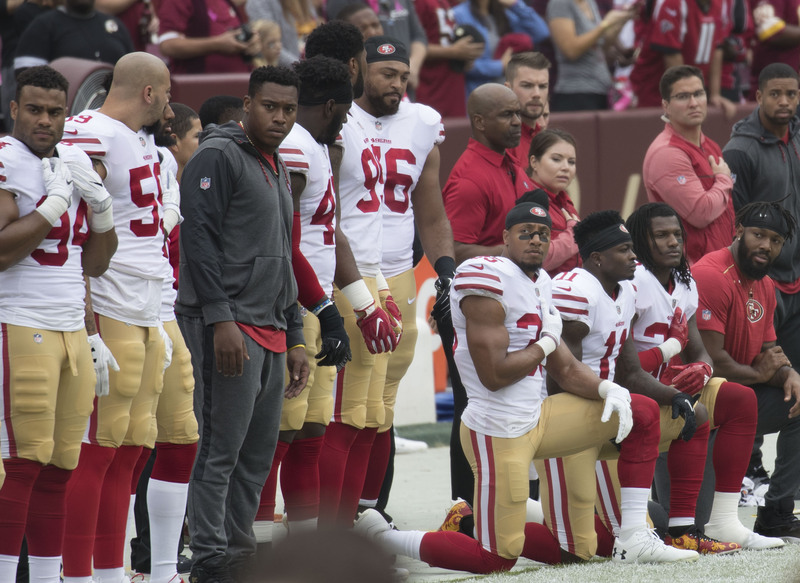 What this new NFL anthem policy essentially does is change the requirement from being on the field for the anthem to standing during the anthem. Before, it was only required that players be on the field and merely suggested they stand. This change has been met with backlash from many different sides. 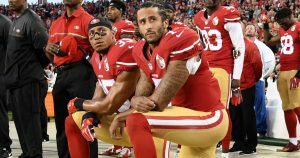 Player are threatening to boycott football, owners are offering to pay any fines accrued by players who still choose to kneel. The biggest backlash is from the lawmakers and fans causing a social media uproars. More bad than good has definitely come from this. But that’s not how it has to be. This new edict from Commissioner Goodell and “The Shield” can be a positive thing. Not only for the sport but those who play it and watch it. All it takes is a little change in thinking. To facilitate that change I am now going to debunk your nonsense. Oh, you thought this was going to be just about bashing the people in favor of the NFL anthem policy? Not even close, so buckle up, buckaroo. The NFL is a business. With a bottom line to protect and employees to manage. Much like a Taco Bell, a law firm, a hospital, or say, the Department of Defense (DOD). All of these employers have the legal right to mandate and dictate almost every aspect of their employees time while in their service. From the way they groom their facial hair, to the uniforms they wear, even the things they talk about. It’s not restricting first amendment rights. It’s merely being a boss. And nobody likes their boss. Nobody. And another point here, this would all be a non-story if not for the MILLIONS of dollars that the DoD has funneled to American sports for the past decade in an effort to create these spectacles of patriotism. It’s called a sponsorship. It’s how most sports franchises and college athletic departments work. I can tell you that from first-hand experience. I worked in minor league baseball for four years and I myself was the liaison between the team and U.S. Army’s recruiting battalion in that region. They sponsored our national anthem and Military Appreciation Day. If they wanted something done, it was done. It was their money, after all. If the DoD wants something done from the NFL, it gets done. That is a lot of money and it is, after all, a business. They aren’t. This is pretty simple counterpoint if you’re not a bigot or a keyboard warrior. Just like Rosa Parks wasn’t protesting public transportation and Gandhi wasn’t protesting food. It’s a demonstration to raise awareness about a social injustice. One of the biggest issues in all of this is the use of “protest” over “demonstration”. An issue of “perception is reality” has arisen because of those who don’t understand the difference in connotation. It’s a DEMONSTRATION during the anthem. Not a protest of the anthem. Let’s start by changing that first. 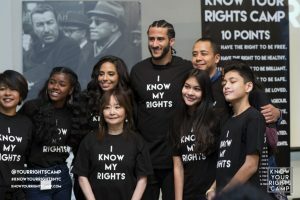 Look, I get it; Colin Kaepernick actually said: “I am not going to stand up to show pride in a flag for a country that oppresses black people”. That certainly was not a great start to the eventual evolution of this debate. However, it has since been misconstrued and broadcast as ‘anti-military’. Don’t believe that the demonstrations have been misinterpreted? Just ask the owner of the Miami Dolphins. I’ve shared my opinion with all our players: I’m passionate about the cause of social justice, and I feel that kneeling is an ineffective tactic that alienates more people than it enlists. If this divide is ever going to be bridged, we have to commit to this change in perception. Those who refuse to acknowledge this change in perception are either too prejudiced/uncomfortable talking about it or are simply too polarized and close-minded. And if you don’t believe the social injustice Kap and Eric Reed and all the others were demonstrating for exists, ask Sterling Brown. The early-American colonists were not protesting tea when they dumped boxes of it into the Boston Harbor, were they? Open your eyes and it’s amazing what you see. I don’t know how clearly I can try and put this for the masses. IT’S. NOT. ABOUT. THE. FLAG. I also realize the majority of people still reading this already understand that while those who refuse to open their minds have already closed out this page and moved on to a Bad Lip Reading of the Royal Wedding. I have long since accepted that it is a waste of time to try and convince close-minded people. All I can do is present the information. If you are still reading this for some perspective, allow this counterpoint. 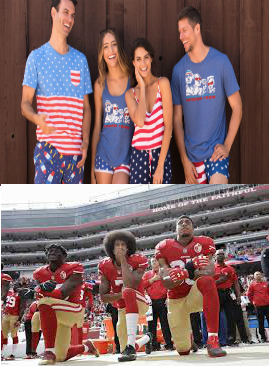 More people who aren’t subject to the NFL anthem policy “disrespect the flag” on a daily basis than the players do. We wear it as a swimsuit, a hat with political slogans, socks, underwear, and shirts. Hell, I have three American Flag shirts myself. We buy paper plates, napkins, cups, tire covers, etc. and display them at every BBQ like it’s just another part of life. According to the U.S. Flag Code, which is in the Constitution, we are all wrong as hell here. According to U.S. Constitution, one group is disrespecting the flag. The other is preparing for a football game. Can you tell the difference? If you want to really get crazy and focus only on the football games where “disrespect” is happening; let’s. What about that guy going to the restroom or getting a beer during the anthem? How about the woman who is far too busy trying to get back to her seat with her hot dog and soda instead of standing up in the aisle? What are they demonstrating? It’s misplaced hatred and it needs to stop. We are all guilty, by law, of so much more than these players. This one kind of piggy-backs off my first point and is the main argument for why the NFL anthem policy can be a good thing. One of the biggest reasons why I disagreed with Kap when this whole thing started was because I thought it was a hollow gesture. Hooray, you took a knee so people asked you a question and you got your opinion out. I was wrong. I even said that on this site. 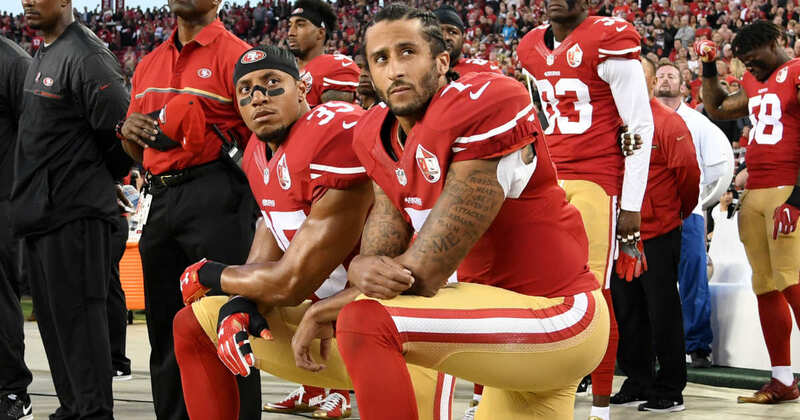 What Colin Kaepernick has been doing is what all of these athletes should be doing. Something tangible. He fully funds his own foundation that helps bridge the gap between children and police in inner cities. He’s helping both sides get a better understanding of one another and gain respect for each other. What he’s doing is actually trying to help solve the problem he was demonstrating for. 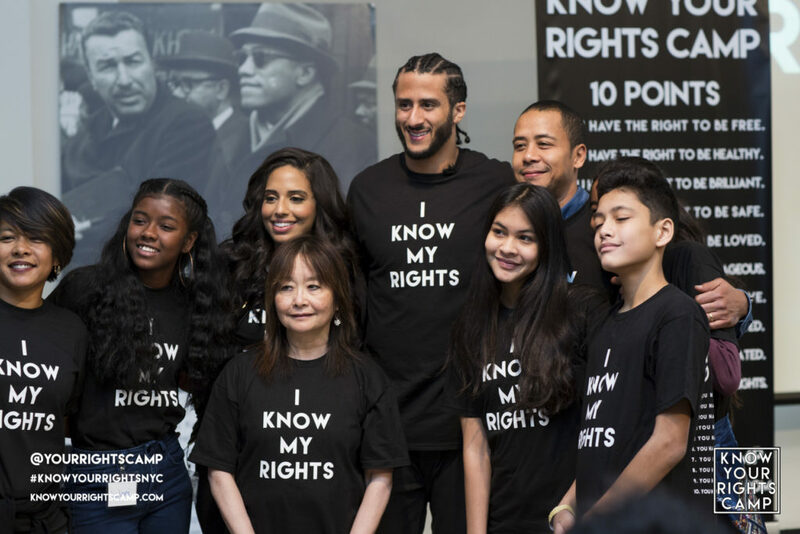 Know Your Rights Camp: a free campaign fully funded by Colin Kaepernick. It’s one thing to take a stand and speak out against something. It’s another to actually do something about it. Whether it’s social injustice against any minority, attacks on our schools, poor funding from the government in the medical field, anything; doing something tangible is a lot better than just posting on Twitter. Stephen Ross said: “I’ve shared my opinion with all our players: I’m passionate about the cause of social justice, and I feel that kneeling is an ineffective tactic that alienates more people than it enlists”. These players have the ability to bring a camera crew with them. Post pictures and video themselves on social media to publicize their actions. They don’t need the media to do it for them. They just need to do it. Like Colin has been. I’m a cancer survivor and I hate how little support there is from our federal government to help cure it or to help the families of those battling. And I haven’t done near as much as I want to in order to help, but I have donated. I have spoken at functions, represented organizations at fundraisers, and talked with people. I’m not saying I’m a model for it cause what I’ve done is peanuts compared to what I could and should be doing. What I am saying is that this NFL Anthem Policy gives the players, coaches, front office, and fans a chance to be better than what they currently are. Go to a rally. Donate to a cause. Attend a function and learn. Do something more than just reading a hot take or posting your own. We can’t get to where we are going without first taking a step. That’s up to you! If you have an argument or all-time great sports debate (I hear people have been pondering the real GOAT of various sports) that you want to be broken down, then let us know! Comment below and see if your topic makes it. Want to hear more from Christian? Check him out on Twitter or subscribe to the “Press Row” Podcast! Thanks for commenting that in here. Different views are welcome for sure. I definitely see where you are coming from. Especially when you look at soccer. I think the intent was more on the unification within a team, though. Getting Started: Table Saw Versus Planer! What Do You Get First?